Most Outstanding Solid Through Solid Mystery I Have Ever Seen! Playing cards placed on both sides of a solid plate of plastic set within a frame. Ordinary pencil passes right through both cards and plastic! You can even pull a 9" scarf through the hole. There is NO HOLE to be found. The plastic is SOLID! It's not an illusion - the pencil and cards & frame can be examined before and after. I defy anyone to discover how it's done! I'm so sure this will be one of your favorites - we'll refund your money if this does not become one of the best tricks you own. For 9 inch scarf for this trick, see that related product below. FOR A LIMITED TIME - 2ND SET INCLUDED FREE IN THIS PACKAGE! THIS TRICK IS ONE OF MY FAVORITES. CARRY IT IN YOUR POCKET & DO IT ANYWHERE. YOU CAN ALSO MAKE A PAPERCLIP OR TOOTHPICK FLOAT IF YOU DON'T WANT TO USE A MATCHSTICK. Uncanny - the match, paperclip OR toothpick FLOATS right in front of their eyes! You display a playing card & place it upon your palm. An ordinary paperclip, matchstick or toothpick (can be borrowed) is placed on the card. The spectator is asked to watch closely - because he won't believe what he is about to see! The card is held within inches of his eyes. At your command the match slowly descends back to the card & is returned to the spectator. The Floating Match is one they'll talk about! Easy to do. Highly recommended. This effect is with permission of Ben Harris, inventor of the original Floating Match On Card. SPECIAL: Buy 2 SETS RECEIVE 3RD SET FREE! Wanna learn card tricks? Then you have to get this book. It's 272 pages full of astounding effects, routines, ideas from the legendary Harry Lorayne and some of his friends & some of the best minds in the history of Magic: Vernon, Carlyle, Garcia, Elmsley & many others. In my top 3 card magic books ever written. If you love unique card magic, this is a must have. Please do not reveal the contents of this manuscript to anyone as this effect is being performed by many well known magicians. You can do this UNBELIEVABLE trick EASILY!! You shuffle an ordinary deck of cards, which can be borrowed, & cut the pack into 4 or 5 sections & hand them out to spectators for more shuffling. When the shuffling is complete a spectator gathers the shuffled sections together and reassembles the pack. This done the spectator deals himself 8 cards face down. The performer is nowhere near the cards. The spectator fans the cards towards himself. Emphasizing again that the cards were shuffled by the audience members themselves YOU proceed to name one at a time ALL 8 CARDS THAT THE SPECTATOR IS HOLDING! Don't Miss This! We supply real U.S. coins that have been specially machined to be examinable & still perform miracles! All these tricks are simply explained so YOU CAN DO THEM! Tricks like: GONE!/ Cornucopia In Reverse/ Vegetarian Reappearance/ Dime Penetrates Card In Glass!/How Money Flies (Dime Vanishes) and much more! This is a bargain! 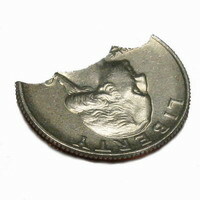 This is the same BITING A COIN effect you've seen David Blaine do on TV! Click here to watch David perform this trick! YES! Borrow a quarter. Place it in your mouth and bite on it. You've bitten out a section with your teeth! With a blowing motion, the missing piece immediately reappears! 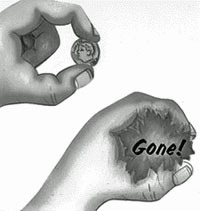 Quarter can be examined and returned to owner. Borrow a soda bottle & half dollar or quarter (according to which version you have). Have it marked for the later identification. Throw coin toward bottle & it instantly appears in bottle! How did it get inside? The neck is too small - but you can even take it out & return the same marked coin to its owner. Comes complete with routine & miraculous gimmick that does the work for you! Quarter Version. Push a borrowed rolled up dollar bill, pencil or cigarette through a quarter! target="_blank">Click here to watch Criss Angel perform this trick! Take a quarter (can be borrowed), clearly showing it on both sides. Now visibly PUSH A ROLLED UP DOLLAR BILL, PENCIL OR QUARTER COMPLETELY THROUGH THE MIDDLE OF THE QUARTER! You do this slowly and clearly! The SAME quarter is shown on both sides. Pass EVERYTHING for full examination if desired. There is no hole to be seen - because THERE ISN'T ONE! Round pencil or rolled up dollar bill can be substituted for cigarette. Absolute reputation maker. SPECIAL: Buy 2 Receive a 3rd FREE! This is the miracle gimmick you've heard about! These specially made thumbtips, invisible to your audience. Our set includes a fantastic book with over 50 tricks you can do with this one gimmick! And you'll think of many more! Put on a whole show! Tricks such as burn and restore a borrowed hanky or napkin! Produces silk hankies, salt, liquid, more! Carry it in your pocket and start performing impossible miracles for your friends on a moments notice! Very highly recommended. My favorite trick is to make a colored scarf vanish and appear with your sleeves rolled up. The special thin pure silk scarves required for this trick are also found on this page. This is the regular adult size. 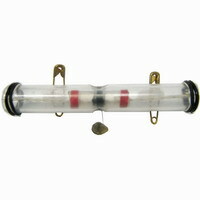 It has a 7/8" diameter vertically and 15/16" diameter horizontally. Tape the ends of a small strip of paper 3 1/8" long to get an idea of the circumference. If your thumb won't fit or if the paper breaks, get the next larger size. On this page you'll find other size thumbs & our thumb tip tricks video. Use our GLITTER CONFETTI on this page. Adds a nice dramatic magical touch when making your objects vanish! You've Seen David Copperfield Do This On TV! Sellout at Magic Convention! Imagine This: A compact device allows you to leave objects (such as a $20 bill, rings, credit cards) suspended in mid-air right under the spectator's nose. Allows you to walk away! You then command the object to slowly float down to the floor & without moving a muscle the object floats back up to your waiting hand! LISTEN TO THIS: You can pass a solid steel hoop over the floating object, proving no connections, then hand the hoop out for examination! Don't miss out on what is proving to be the greatest magical breakthrough of this century. This device is very versatile & will allow you to perform many effects that were not even possible a year ago. You can perform a vanish of a small borrowed object, this vanish is so clean that it looks like television editing! The reproduction of that object is even more incredible as you apparently pluck the object from an empty void of space! You'll appear as though you have spent your life practicing sleight of hand, yet you will be performing these miracles in a matter of a few days practice! (This is taught in detail on Secret Video Vol. II). When you purchase this device you will not be buying a single trick as it is a quality device offering unlimited possibilities. Includes Floating Bill routine, other tricks on Videos Vol. 1 & 2. We highly recommend purchasing one or both videos as they make it easy to watch & learn the use of the fantastic device, plus proper care of it. When you buy this Abracadabra Magic, we include an EXCLUSIVE BONUS TRICK! 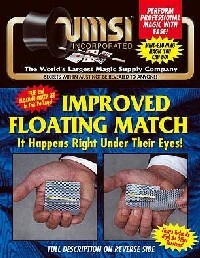 One of our magician friends came up with a NEW idea to use with your SECRET FLOATING DEVICE. Now you can use your fantastic gimmick to make ordinary objects MOVE just through your MIND POWER! Because the new user is just learning the correct tension and the weights of what objects they can and can't use when they're first learning the effect, parts are most likely to break during initial learning & practicing. Once mastered, parts will need replacing less frequently. We highly recommend purchasing our replacement kit with our floating device. Special "you know what", replacement tube and O rings. Differences between the regular and micro sizes: The regular size provides the ability to walk further away from the items while the MICRO SIZE can be hidden in places the standard cannot. You can still walk away while the item floats, but not as far as the regular size. Magician's Wax is required which is shown on this page. This product is not made by Sorcery Manufacturing, the manufacturer of the ITR. If you like unique card magic, this one is too good to pass up! And if you don’t want to use cigarettes, you can use any rolled up dollar bill! A spectator freely selects a card from a deck which is then signed by a spectator. You then pass a borrowed cigarette or rolled up dollar bill right through the middle of the card, then toss the card out for examination! Afterward, the signed card is given to the spectator to keep as a memento. This effect is incredibly easy to handle. It has a very clever gimmick and comes highly recommended. Use a matching regular Bicycle deck and you are all ready to start performing miracles! SPECIAL BUY 2 RECEIVE 3rd FREE! Send a blank email to: wholesale@umsiinc.com and we will respond with the information. MAGIC TRICKS: Click here for our NEWEST TRICKS! Copyright ï¿½ 2005 UMSI INCORPORATED - Reproduction Prohibited.